Home / Reviews / Pets / Do you love your dog? Walk your dog with love! Do you love your dog? Walk your dog with love! I recently found a really neat product called Walk Your Dog With Love, it is a harness set up to help you walk your dog no matter what the breed with gentleness and to stop them from pulling on the leash while you are walking them. This is a no-choke, no-pull, more-love way of walking your dog. I was pretty doubtful that it would actually help with my dog, Bella, she is a bit of a beast, half lab and half Old English Sheepdog, she is a lot of dog to walk and do anything with. I usually hold on with both hands and do all I can do to keep her near me. The craziest part of her is that when we go off leash she is good, but the moment I put a collar and leash on her she just flips. With the Walk Your Dog With Love harness, she was not instantly better. I know you expect me to have a glowing review and that I should not say anything negative, but wait, this was not an instant cure for her pulling, we had to take some time to re-train her and train ourselves to lighten up on the leash and not give into the pulling, by pulling back. Some of the things I loved about this harness include the ability to put it on over her head around the tummy and then click it in place, the leash fits in the front of the dog and you are not pulling on the neck at all. As you can see in the picture below, it is not even around their necks. After putting this on Bella a few times and letting her cruise around the house for awhile we decided to take her out for a little walk, it actually went pretty well. She pulled a little in the beginning but after a bit she realized we were not going to be tugging on her and she had no reason to tug on us. We are moving toward a no pull at all walk, and it is going really well. She responded so well that taking her out now no longer scares me and I don’t have to worry about being pulled down the street. If you have a big dog who pulls or if you have any dog really that pulls you know the fear I am talking about. 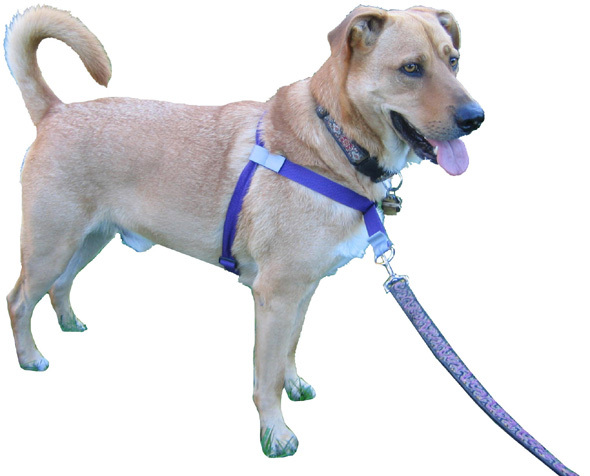 There are quite a few “solutions” you will find in the pet stores, but I have yet to find one that works as gently or better than the Walk Your Dog With Love Harness. They also sent me a Zen walking belt, with that you simply attach it around your waist and attach the leash to it. I have used it at home and in the yard, we are not ready to take it out yet. The Zen Walking Belt really keeps her more grounded and almost like she is leash free. If you love your dog, but hate to do the daily/nightly pull down the street, I am telling you, this is the best thing we have found to stop the pulling, it is not instant, but it is really good! If you would like to purchase your own, go here and use code TFASM, it will get you 15% off on any purchase. Next post: Bil-Jac Dog Food, Made my dog want to eat again!